This is a procedure that allows for the treatment of pre-arthrotic changes of the hip joint of primary or secondary origin, without the need for joint replacement. A procedure with high efficiency in terms of prevention of degenerative hip joint changes, which will postpone the need for hip joint endoprosthesis for 15-20 years. In the case of an indication at a younger age, the necessity of one implantation cycle in the form of reimplantation is avoided (the lifespan of the total endoprosthesis = 15-20 years). This is a very specific and unique procedure that we provide in a full and comprehensive range as the only workplace in the Czech Republic. In addition to our workplace, this procedure is also performed by some facilities in Austria and Switzerland. 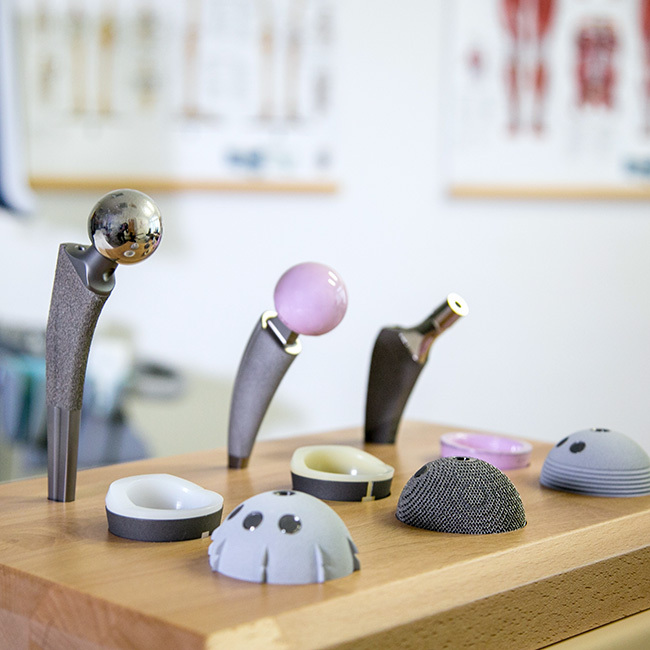 Recently, the anterior approach has gained popularity in the German-speaking part of Europe and France. This approach is, in the strict sense of the word, mini-invasive, not because of the length of the cut, but because it makes use of the Smith-Peterson’s interneural interval. This means that access to the hip joint is conducted in the space between two groups of muscles, one of which is innervated from the n. Ischiadicus (the septic nerve), the other from the n. Femoralis (the thigh nerve). The undisputed advantage of this surgical approach using the aforementioned implants is less surgical tissue damage and therefore faster rehabilitation after hip replacement. The postoperative rehabilitation care ward includes above-standard rooms, physiotherapy rooms, fully equipped electrotherapy and hydrotherapy, and an indoor block with a garden. 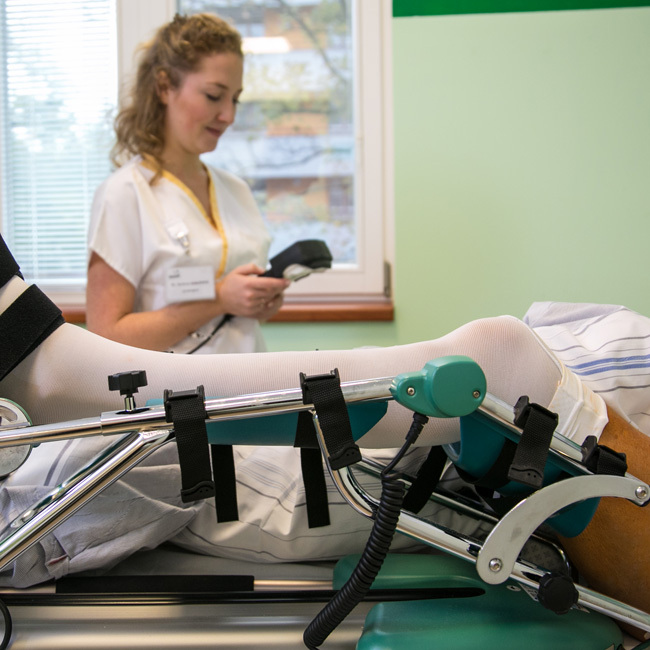 Comprehensive rehabilitation care is provided by a team of rehabilitation physicians, supplemented, if necessary, by physicians of other specialties, physiotherapists, an occupational therapist, prosthetist, nurses and nursing staff. The basis of treatment is individual exercise with a physiotherapist, possibly augmented by ergotherapy aimed at improving self-sufficiency in normal activities. Other components of care are electrotherapy, magnetotherapy and ultrasound treatment. Another important part is the complete range of hydrotherapy treatments – whirlpool baths, underwater massages or individual exercise in the Hubbard Tank. We offer patients the possibility of above-standard procedures, including acupuncture, massages, laser electrotherapy, shock waves and hydrotherapy procedures (bubble baths, herbal baths). The guarantor of the high quality of the care provided is the Chief of the Rehabilitation Clinic of the University Hospital Motol, prof. PaedDr. Pavel Kolář, Ph.D., who is a world-renowned rehabilitation expert and regularly lectures and trains on this issue, especially in the USA. The physiotherapy department provides care to patients with chronic pain in the locomotor system, especially in the back, spine and supporting joints. We also care for patients who have suffered injuries or neurological illnesses. Via proper education, we also contribute to the prevention of diseases of the neuromuscular system. Rehabilitation exercises and procedures are performed under the supervision of experienced physiotherapists. We use state-of-the-art devices, aids, and healing techniques, allowing for an individual approach to each patient and the adaption of therapy to their needs. 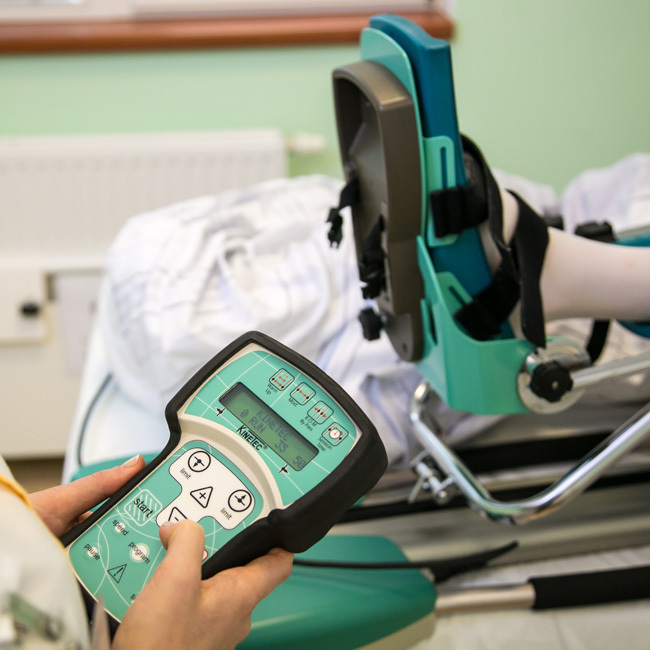 As part of physical therapy, we provide electrotherapy with all kinds of electrical currents, including electrostimulation, electrogymnastics, magnetotherapy, vacuum-compression therapy and ultrasound. We use a shock wave for insertion pain associated with overstressed muscles, and a laser to accelerate the healing of scars and ligaments. The rehabilitation line includes complex hydrotherapy.